Elizabeth Winthrop is our featured author today. She wrote the award winning book, Counting On Grace. It hit the #1 spot in the Children's and Young Adult section of EBooks.com on Saturday, April 26th, and the following week it was still there. If you visit Elizabeth's website, you'll see the fantastic reviews this book has received, and the comments readers have posted show how it has struck a chord with so many. Let's hear all about it. First, Elizabeth, tell us what your book is about. COUNTING ON GRACE, inspired by a haunting Lewis Hine photograph of a 12-year-old mill girl in 1910, tells the story of Grace Forcier, a French Canadian spinner who is proud to work by her mother's side as a doffer in a Vermont mill. But when Hine arrives at the mill to document the horrors of child labor, Grace becomes his secret ally, a decision that brings both devastating repercussions as well as the possibility of a different life for this one child. This acclaimed novel,a recent selection of the New York State Common Core, was a VERMONT READS choice. It also won the Massachusetts Honor Book in Children’s Literature and the Jane Addams Peace Prize Honor Book for a novel of excellent literary quality that highlights social justice issues. Traditional. I've published over sixty works of fiction for children and adults. These include picture books, middle grade fiction, and two novels for adults. I'm currently working on two memoirs for adults. I started my career working as an editor under the legendary Ursula Nordstrom at Harper and Row. 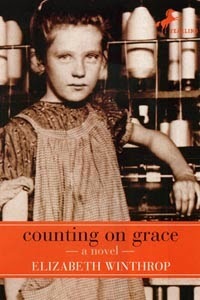 The interest in COUNTING ON GRACE has been building steadily since it was first published, perhaps because kids who read about Grace can imagine so easily that a century ago they might have been that barefoot kid working in the mill six days a week, twelve hours a day for almost nothing. Although I have a Twitter handle (@EWinthropAlsop), a Facebook author page and an extensive website (www.elizabethwinthrop.com), I think word of mouth is working better than anything. My experience is that children are reading more because they can get a book instantly on one of their ebook platforms. I know I'm reading more myself. Kids gobbling up books...what can be wrong about that? They're hungry for story as are we all. What were your initial thoughts about e-publishing? Was it your idea or your publisher’s? Have those initial thoughts changed now that you’ve done it? Three of my novels for children are published as ebooks by the original publishers: COUNTING ON GRACE, THE CASTLE IN THE ATTIC and THE BATTLE FOR THE CASTLE. I was concerned that I would lose control of copyright as so many of our books are pirated. I believe, to some degree, that has happened, but still, every year the sales increase so I've been pleased to see these books finding an even wider audience. I have also put up two of my own ebooks under my other writing name, Elizabeth Winthrop Alsop. The first is a short memoir for adults called DON'T KNOCK UNLESS YOU'RE BLEEDING, Growing Up in Cold War Washington. The second is an ebook edition of my adult novel, ISLAND JUSTICE. The audience for these books continues to grow thanks to the ebook platforms. I write in the mornings from 9:30 to 1 pm or so. Then I break for lunch and work on the business of being a writer: royalty statements, publicity, research, etc. I've finished the first draft of a memoir for adult readers entitled A FRAGMENT OF WHAT YOU FELT, Tracking My Mother. As a Theodore Roosevelt descendant and the daughter of a powerful cold war journalist, Stewart Alsop, I'm finally turning to my own family's story, a memoir of my parents wildly romantic love affair in wartime England which I look at through the lens of my mother’s increasing dementia and decline.And the second memoir, called THE CHILDREN OF SPIES, expands the story of my childhood in Washington. Writers are eavesdroppers so I was the one listening at the top of the stairs to the conversations of the Washington power brokers. Learn more about Elizabeth and her books at her website or by following her on Facebook, Twitter, or on Goodreads.